One of the reasons I love social media is the friends that I have made from all over the country. When you have a child with special needs, having an online community full of people who "get it" makes you feel like you are not alone. I have met so many Moms that have children with Down Syndrome through Instagram, and all of them are amazing. I am so thankful for the relationships we have developed as a result of our precious children. One of those friends is Mollie Glasgow. Mollie is the mother of three beautiful girls and has a precious son named Fox waiting for her in China. "We are the Glasgows! Jarrod, Mollie, Willow, Wren, and Pippa. We are in the process of adopting our son, Fox, from China. Adoption has always been something our family has been drawn to. After the birth of our second daughter, Wren, who was born with Down Syndrome, we felt God specifically calling us to adopt a child with special needs. In many other countries, children who are classified as “special needs” are often abandoned, neglected, and even left to die, simply for having what are considered to be less-than-ideal health conditions. We began the adoption process in November of 2015. At that time, we had a 7 month old baby, debt from medical bills, and zero extra room at our house. A crazy time to begin the adopting process right!?! BUT we did not choose to adopt because the timing was perfect, or because we were financially prepared... we chose to adopt because God’s calling on our lives felt urgent. God was calling us to trust His plan for our family and join Him on an incredible and scary journey. We have had zero regret since saying yes to adoption. Fox was brought into our lives through a crazy series of events. From the first time we saw his face and heard his story, we felt God speaking to us that this child is SO WORTHY. Fox was born with a complex heart condition and has had to fight so many battles, including two open heart surgeries, in his short two years of life. Never before have I known someone more worthy of life. More worthy to be loved. More worthy to have a family. More worthy to have someone fight for him. More worthy of happiness. Fox is WORTHY and wanted. We feel incredibly honored to be Fox's forever family. We are going to do everything in our power to give him the life he deserves." Every child is worthy of love and worthy of a family. Let's help Fox get to his! You can do so by purchasing a "Worthy" necklace. They are $25 and will ship within 3 weeks of purchase. 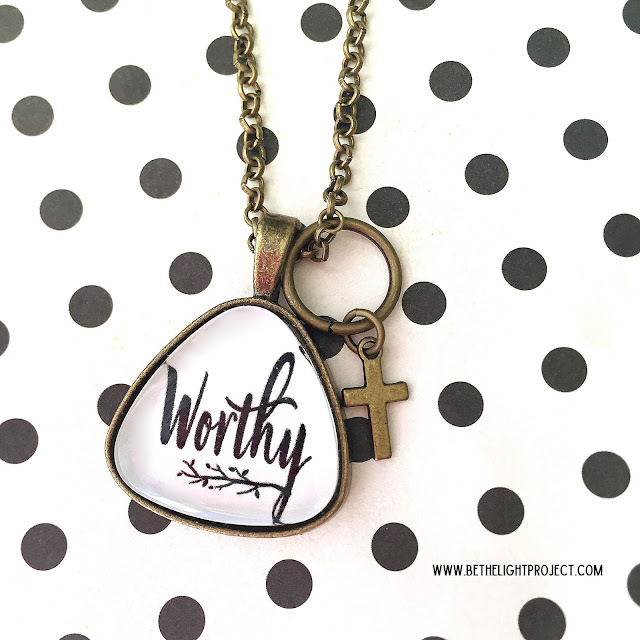 Half of the proceeds from this necklace will go to the Glasgow family. They will be traveling to China in the next few months, and these funds will help with their remaining adoption fees. Click here to visit our shop and purchase yours. You can also visit www.adoptinglittleglo.com for more information and a link to donate more if you wish to do so. Thank you, and God bless! !